I used halibut, scallops, shrimp, and clams for this Seafood en Papillote and spooned a little sauce that’s got aromatics and acid to highlight the seafood. Cooking en papillote creates intense flavor from steaming the ingredients in a tightly closed container. The parchment paper makes a dramatic presentation and when the diner rips it open that flavorful steam makes your mouth water. En papillote simply means cooking “in parchment” in French. The Italians call it al cartoccio. Essentially, these are little packets of tender proteins with thinly sliced aromatics, herbs, spices and/or vegetables with a drizzle of acid, such as citrus or wine, a dollop of butter, and a sprinkle of salt and pepper, and tightly wrapped. The cooking method is a combination of baking and steaming. The enclosed package keeps the steam in, cooks quickly, infuses flavor, and keeps food moist. The most important thing is to create a tight seal, so the bag puffs up. 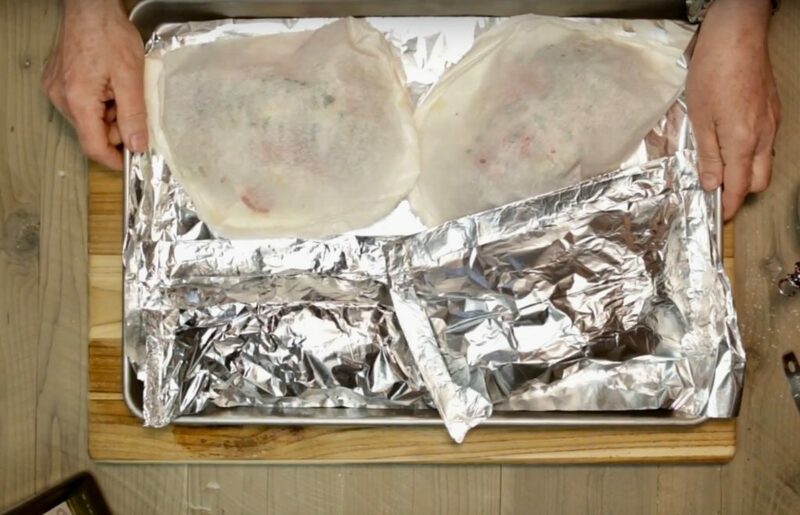 Using parchment paper can be a little tricky and aluminum foil is virtually fool-proof. 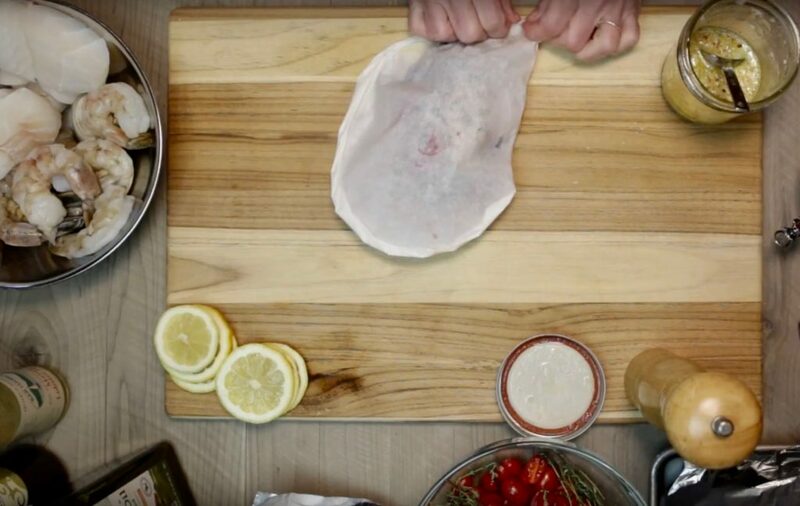 The parchment paper, however, makes a more glamorous presentation – slightly charred paper that pierces easily releasing the aromas under the nose of the diner. Fold the parchment in half and trim to a 15″ x 12″ rectangle. Draw a half heart shape on each and cut with scissors. Open and lay the ingredients in the center, fold the paper over and crimp. Start at the top of the packet and fold ½-inch over and crease well. Continue making ½-inch folds with a firm crease until you reach the bottom point. Crimp and tuck final pleat under the packet. The key to success is a tightly sealed packet to contain the steam. Use either regular or heavy-duty foil that’s 20 inches wide. Pull 4 sheets that are 20 inches long. Fold in half, open and place the food in the center of one side. Fold over and square off the side by folding the edge. Turn and fold each end, pressing hard to seal tightly. The advantages of foil is the ease of creating a secure seal and if you open the packet and the food isn’t cooked through, it reseals easily. 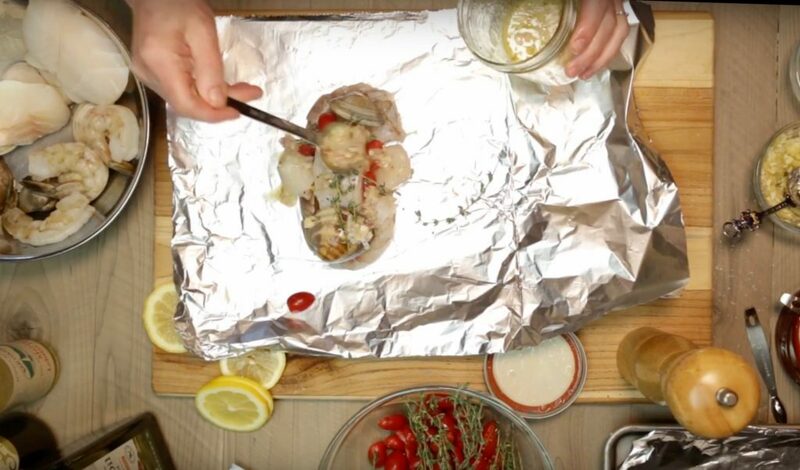 Watch the Seafood en Papillote video here. 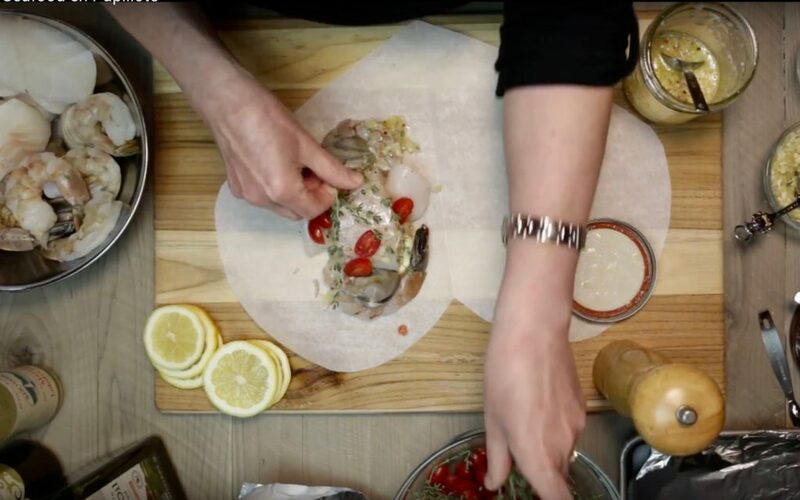 Cooking en papillote is fun to make and intense flavors are easy to create because of the cooking method. 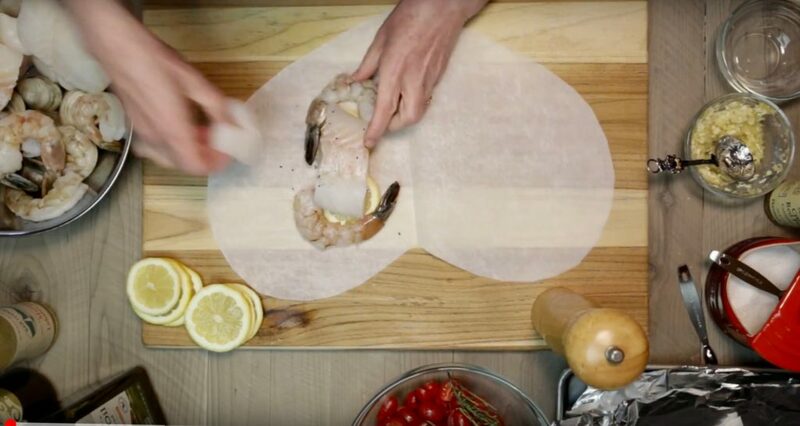 This Seafood en Papillote recipe uses halibut fillet, sea scallops, shrimp, and cherrystone clams. Parchment paper or foil wrappers. Combine the wine, clam juice or fish stock, shallots, garlic, salt, and pepper flakes in a covered container. Place 2 slices of lemon centered near the midsection of each wrapper. 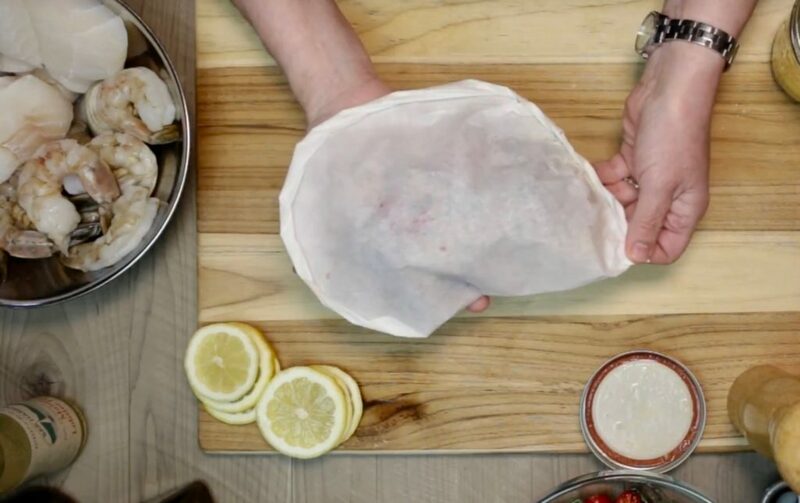 Set one fish filet on each of the lemons, set 2 clams, 2 shrimp, and 2 scallops, and 2 cherry tomatoes around the fish. Top with 2 thyme sprigs. Shake the wine sauce to combine and pour a quarter over each fish and top with a one piece of the butter. Crimp each packet and cook in the preheated oven for 15 minutes. Serve in the package and let each dinner open. The aromatic steam is part of the experience. Fold in half, open and place the food in the center of one side. Fold over and square off the side by folding the edge. Turn and fold each end, pressing hard to seal tightly.